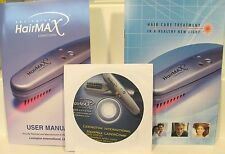 HairMax Ultima 12 LaserComb - Laser Hair Loss Treatment, FREE SHIPPING! Get your hair back! Incredible results fast treatments! 5 out of 5 stars - HairMax Ultima 12 LaserComb - Laser Hair Loss Treatment, FREE SHIPPING! 4 product ratings4 product ratings - HairMax Ultima 12 LaserComb - Laser Hair Loss Treatment, FREE SHIPPING! Ultima 12 LaserComb Laser Hair Regrowth Device. By HAIRMAX; made in the USA. You'll start seeing benefits in 12-16 weeks. - Power Cord. - Deluxe Storage Case. HairMax LaserComb. - Ultima 12 LaserComb Laser Hair Regrowth Device. Hair Growth Device. - Power Cord. System includes. This unit was bought for my husband. After a few try's he decided to get a transplant. This item is close to nearly new condition. HMI V5.03. Laser Comb. Hair Loss Prevention. Like New, older. HairMax Prima 9 LaserComb - Amazing Hair Loss Treatment, FREE SHIPPING! Participants using the HairMax LaserComb experienced significant new hair growth. The LaserComb provides low-level laser light energy that stimulates hair follicles promoting new hair growth. LASERCOMB is pre-owned but like. Use the Prima 9 to target thinning areas or for full scalp coverage. HairMax Prima LaserComb (Prima 9), Stimulates Hair Growth, Reverses Thinning, Regrows Denser, Fuller Hair. Light, Portable, FDA Cleared.